April 1, 2016 – Littleton, NH. 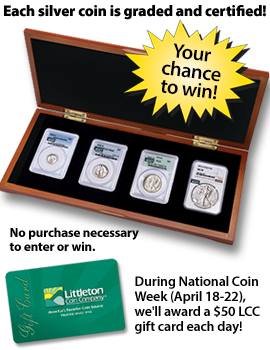 In honor of National Coin Week and this year’s American Numismatic Association’s Portraits of Liberty: Icon of Freedom theme, the Littleton Coin Company is hosting a Liberty Silver coin sweepstakes! The grand prize is a dynamic 4-coin set of famous liberty coins, including an Uncirculated silver Mercury dime, Standing Liberty quarter, Walking Liberty half dollar and 2016 MS-70 American Silver Eagle. Each mint-state coin is graded and certified by PCGS or NGC, and all are placed side-by-side in a handsome display case. The estimated retail value of this collection is over $1,300. Click here for entry and official rules.